Cast: Nathan Lane, Matthew Broderick, Uma Thurman, Will Ferrell, Roger Bart, Larry Beach, Jon Lovitz. Directed by Susan Stroman, from the Mel Brooks Broadway play, from the 1968 Mel Brooks movie. Story: Broadway producers deliberately make a flop so they can do a runner with the money. Well, something had to end the current run of average comedies on the big screen. The Producers fulfils the brief in spectacular style, by being so achingly awful that I couldn't even bring myself to sit through the extra stuff in the end credits - I was so relieved to see them roll that I got out of there quicker than Kate Moss during a drugs bust. I blame Mel Brooks. In interviews he's been saying the purpose of The Producers was to capture for posterity Nathan Lane's and Matthew Broderick's performances from the successful Broadway show - and that's what they've done. It's like watching the show. Except that we're not forty feet from the performers, they're right in front of our noses, so every little action looks vastly overplayed and every line is shouted into our ears, destroying any semblance of plausibility that might have trickled in. This is most apparent in Matthew Broderick, who looks and behaves like a schoolboy simpleton in a Christmas panto, moving and delivering lines with all the skill and grace of Bernard Manning on ice skates. 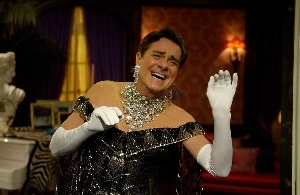 Nathan Lane, however, is much better. Given the fatal brief of putting his stage performance on screen, his mugging and camp pratfalling that made The Birdcage so difficult to watch are actually a bonus here and he demonstrates why he's made the role his own - though it's very difficult to buy him as a straight man, he's clearly as bent as Elton John's poodle. OK, deep breath, what else is wrong with The Producers? Let's talk about the pace. From the very first scene, it's clear that Lane and Broderick know these parts backwards - the lines are delivered too quickly, as if they're as automatic as reciting the alphabet. The main idea takes too long to gel and the set pieces in between are forced to the length of a song each rather than being given the time they need. Then, once I finally thought I'd get to go home and start bleating about it, there's another tacked-on twenty minutes of monumentally awful conclusion to endure, including one utterly pointless scene where Lane recaps the whole movie in a singularly unfunny musical number, that serves absolutely no purpose except to waste another few minutes of my precious life that I could have better used inventing creative ways to pick my nose. Will Ferrell and his pigeons raise the only smiles to be found simply by him playing his usual boorish character, while Gary Beach and Roger Bart (as Carmen Ghia - the name being possibly the funniest part of the whole sorry affair) are cringeworthy as the directorial team with more campness than the Milletts summer sale. Surely we're beyond getting laughs out of exaggerated campness by now, aren't we? Hasn't Big Brother killed that joke stone dead by now? Please? Right, I feel better now I've vented my spleen a little. Now comes the tricky bit. The Producers, despite being a horribly conceived and childishly played piece of crap, is attracting a significant number of positive reviews from the paying public. This makes my life a little difficult as I now have to try and help you to predict if you're going to be among them and thus whether you should part with your hard-earned cash (or hard-stolen, you could be Ronnie Biggs for all I know). The essence of the praise seems to be that it's a stage play on screen, which is curious. For me, the attraction of a stage play is having the performers physically present, actually singing to you in person. There's a frisson in the air, a sense that things could go wrong but for the talent and professionalism of the people who've decided to give up their evening to perform for this particular audience on this particular day. This atmosphere makes average musical numbers seem great and ordinary jokes seem funny, because the audience is involved in its own tiny way. When put on screen, all these qualities are lost. Normally they are replaced with all the wizardry that a movie can offer (subtlety, complexity, visual effects, nuances of expression etc. ), but there's none of that here. It's just a load of stage actors with cameras up their noses. I could bang on about why The Producers is a turd all night, but let's stop the verbal diarrhoea and sum up. 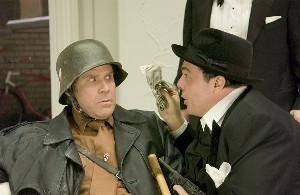 The Producers is a movie to polarise opinion. It is indeed the stage play on film - this is its strength and also its greatest weakness. If you can't get enough of the likes of Chicago, but think it could be a little more ... erm, how can I put it ... "Liza Minelli" ... then you might be one of the few. However, unless you're a big fan of stage musicals, stay well away - cleaning the oven will be more fun than this and you might even get a shag out of it. I think the average moviegoer will enjoy it: 0/5 or 4/5, depending on your fondness for burgling turds. Testosterone Satisfaction Rating: -1/5 - more likely to turn you gay than turn you on. To enjoy this film you should be: too tight/poor/far away/flatulent to see the stage version. The Producers is on general release in the UK now.